Browser closes for no reason - virus?! This is a screenshot of the error message I received, what does this mean? The only recent change i've made to my computer was yesterday when I installed the mcafee internet security suite, could that be it? You are posting a reply to: Browser closes for no reason - virus?! You are reporting the following post: Browser closes for no reason - virus?! In reply to: Browser closes for no reason - virus?! I know their going to ask you what browser you have and what kind of programs such as antivirus,spyware and so on.what is your OS. Its easier for people to help you if they have more info. Okies, well I'm using windows Xp SP2, erm I use IE. Yanneh, Hi, first thing you should do is run a virus check, then run Adaware and Spybot, make sure you get the updates on all these apps regularly. Sounds like your McAfee may be causing a conflict with another program, but with these PCs it could be any number of things. What is Photobucket? It could also be the culprit, have you been using it awhile? I use AVG antivirus, it's free and works great. I used McAfee in the past and had alot of problems with it. Hope this helps you. Hi thanks for all your replies! funny thing is, it hasn't happened again since in the past few hours. But I think an internet explorer add-on that came with mcafee was doing it - the "Mcafee Anti-Phishing Filter" But I'm not completely sure, My mum had problems with Mcafee on her computer too, it wouldn't even allow her to remove it - it said there were missing files or something, But that's sorted now. "What is Photobucket? It could also be the culprit, have you been using it awhile?" Here it goes again, this time no error messages. It just shuts off. but earlier my browser froze and I got a message box saying "Dr Watson postmorten debugger has encountered a problem and needs to close..." and then I had to restart because everything just went really weird (trails while dragging windows ect) This is just starting to be a bit of an annoyance, I've tried various things like disabling certain features on Mcafee but to no luck, It's odd. Like it starts up and gets really bad then suddenly disapears for a long time and comes back again, what is this some kind of fussy virus??! Norton is better than McAffe? I think they are both garbage that borderline on being viruses on their own. After all don't viruses cause your computer to run slow and crash. In reply to: Norton is better than McAffe? it makes about as much sense as "oh cars crash and kill people so I ride my bike". if you are going to bother to comment at least offer something useful. I had AVG on my laptop and got two viruses just last week ... had to take it in to be fixed. Not all software programs are hole free. There are new viruses being made everyday and if you're not protected, you'll get hit. It is very important to update. This issue can generally occur if Internet Explorer is not set as the default browser -- the browser started when using the WEB (click Start, Settings, Control Panel, double-click Internet Options, then on the Programs tab click to select the Internet Explorer should check to see whether it is the default browser check box, and then click Apply. Start Internet Explorer and then when asked if you want to make Internet Explorer your default browser, click Yes) [Q284456], or Internet Explorer has been damaged (the Repair Internet Explorer tool is found in the Microsoft Internet Explorer and Internet Tools option in the Add/Remove Programs tool). Do a restore of your system, back to when you weren't having this problem, to see if it still happens. Hopefully the problem will stop, and you'll know then it was due to something new that wasn't cooperating. If you have to reinstall it, you'll at least know what to expect, and then can seek out the way to fix it right for you. Good Luck and "knock on wood!" You said you scanned your computer and found nothing. What did you scan it with? When you installed McAfee Internet Security, did you completely uninstall the AV/FW that was previously on your computer. In other words, is this the only AV and Firewall you are using? You said McAfee deleted ''MSAS'' 'for some reason'. These kind of things usually don't ''just happen''. Although I only use McAfee's VirusScan and Firewall and not the ''Suite'', they run quite nicely with MSAS. Could you elaborate a bit more on why/how you think McAfee ''deleted it''? 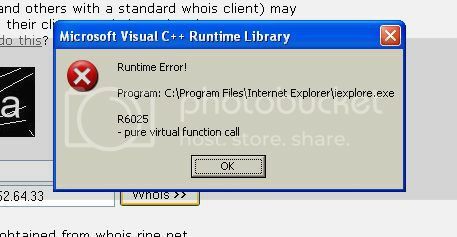 Are you on a specific webiste when you see the runtime error? Also, did you read the article Cursorcowboy originally posted, in ''sbambi's'' post? The only help I can offer is telling you that I've had a great deal of success solving problems at McAfee's Forums. You might want to go to the section that says ''McAfee Internet Security Suite'' half way down the page. You also mentioned the ''anti-phishing filters''. It is noted here that SpamKiller, while attempting to update its anti-phishing filters from a site may cause your system to appear to lock up. There's plenty to read there, if you have the time and patience. If nothing else, I would bookmark the McAfee Forum link. It may come in handy in the future. I seem to be in the minority here, but I'm extremely satisfied with McAfee. Are you still glad you asked for ideas? In reply to: More questions than answers..
Hi, yes I did completely uninstall my previous internet security suite as it expired. And I'm afraid I don't know why it removed msas, it was my mum who was on this computer at the time and she couldn't tell me much, which bugged me. I've noticed the lock up when Mcafee is updating and I do sometimes use p2p file sharing, Which I recently found that Mcafee was blocking. I'll take a look at the Mcafee forum though Thanks! I also saw mentions in regards to PowerPoint. Apparently there is a MS Hotfix for the Powerpoint version of the problem (I can't find). program or conditions it sets up on your machine. Is it not similar to other P2P programs where it keeps an open line/file to retrieve photos for the web? I noted another comment regards to Win Media Player, which strangely enough, may also be keeping something open say radio play function? Are You running only MS Java rather than Java (JRE) from Sun Micro? I'm sensing a security leak problem from MS unpatched Java in conjunction with open file folder to access photos on your machine. Suggest using Windows OffLine version. Save to your My Docs so you always have that clean copy and don't have to re-download if you need to re-install. Now I'm getting error messages! The exception unknown software exception (0xc00000fd) occurred in the application at location 0x02a03785. Aw, I really can't think what's going on, I got these messages with Mcafee disabled, so maybe that's not the problem any more? hmm, any ideas or any more info I should give? Thanks! In reply to: Now I'm getting error messages! files if copy is ok.
clean copy inserted. Good to have disk at hand. Good Luck!! Last night Mcafee found a trojan, I think I got it at that time though while I was browsing a website, it was called exploit...but it had something else after that name which I didn't catch, and a file called video was infected and deleted. I've tried looking in logs and the quarantine to get the name but they're both empty. Have You Installed WMFFix Patch from MS? If Not, This Link..
has an unofficial patch which works fine for me (I haven't got link to MS one). I suggest this due to "..exploit...video..". Very current problem which does download trojan(s)and is drive by installed by bad site. The first link is for a scan to see if you're exploitable, the second is the patch which blocks the exploit. Applicable only to NTFS OS's (NT,2000,XPs all). Hope things show improvement. Lets us know! You say that each time the browser crashes now PhotoBucket is hanging around. I know you said you've used this program a couple years without problems. But, sometimes software just gets a bug in it for no reason. Did you recently upgrade or update your Photobucket? Crazy things happen sometimes. If error checking doesn't work, I'd try shutting down PhotoBucket and see what happens, since you're getting error messages mentioning PhotoBucket. You may even have to uninstall and reinstall PhotoBucket. I have run into similar problems with a program in the past and this worked for me. infected wit virus. use antivirus n spyware, is enuff. I had exactly same problem while using the Opera browser -- which I had been using for quite awhile and loved. But it started doing the same thing you describe. I uninstalled it and downloaded the newest version of Firefox and it is very stable! I was even able to add extensions to make it work just like Opera. Has not shut down once on me in over one month. I even have an extension that allows me to view a site instantly in IE if, for some reason, you need IE (like microsoft sites and PCPitStop). I too have the same problems with IE. It tends to cradh whenever a site wants to run Flash. Error tracking screen and auto report comes up thelling me that IE doesn't know how to run the plug in correctly. since I don't have admin rights on this machine the suggested fix is meaningless. I would just like to see miKro$loth write a program that doesn't crash when the expected plug in isn't the correct revision number for the web page. I don't blame flash for this behavoir, it is an IE problem - IE is the program that crashes, but it tries to blame a plug in I don't have as the problem. Hey all, I just read almost all of this and would like to ask anyone if they've tried to delete and reinstall internet explorer to see if that fixes it. It involves changing a registry setting so xp doesn't see a browser then change setting back to one and reinstall it. It may be something to try. hope this can help you out. let me know what you find out so maybe i can learn from you too. i will post what i find as well. well you have had a lot of tips and I concur with some and not with others. I had trouble with McAffee and moved over to Norton System Works. I had a little trouble installing it and getting the bugs sorted out but now it runs great. I suggest there is a conflict between the anti virus and photobucket functions for sure, and maybe some other programs you have. The trick is to find out what programs are conflicting. What you could do is ammend the load at start up list to eliminate any program you think might be conflicting with McAffee AV and then restart your pc. Use it see if problems continue or not. Then start up your applications one at a time and see when problems occur. This way you may find out what programs are causing the shut down. Remember that the AV program scans anything that might contain a virus or spyware so whenever you open or close something the aaav will kick in. If the AV is suspicious of what it finds it will block it or shut it down and that may be why you browser is shutting down. My experience with anti virus programs is that when they are installed onto an already loaded computer conflicts are inevitable and a good solution if you can find the program in conflict is to uninstall it and reinstall it after the antivirus is installed. Since your problem seems to be mostly with Photo bucket I would try uninstalling its components from your system and see if that stops the problem then reinstall it and see if the problem returns. Have you come across ZoneALarm from Zone labs. It is a fabulous firewall anti spyware program that i will never do without. It puts control of everything that comes and goes from your pc into your hands. You in effect control all traffic and nothing comes or goes without your permission. It is easy to use and ther is even a free basic version which I used happily for several years till i decided the program was so good it was worth paying for the extra features. You might also look into GRC.com a computer owners friend with info and support worthy of your attention. hi this is andrew. i would like to know what your os is. os: means windows xp or 2000, or 98. etc. so what is it? also, what browser are you using? secondly, i am not a big fan of makafee due to promblems i have had. lol. anyway i think i can help. it is possible you might have spyware. although dont freak out. but it is very important you know about it. im glad you found download.com they are great! go to there spyware center(or type in the search box the names of these programs) and download the following programs: spybot search and destroy, adaware, and windows defender. internet suite from makaffe should include antiviruis protection. if it does, have makaffe update before you scan for viruises. once complete run the tools i have shown you. they will find any spyware and elimanate it. once scans are complete let me know if the promblem occurs more if it does it could be due to makafee causing it to mess up. after scanning and everything, uninstall makafee. once makaffe is uninstalled see if the promblem still occurs. you can uninstall makafee in control panel in add remove programs. ok? if the promblem doesnt occur anymore it was makaffe. so i recommend you take makaffe back if it caused the promblem. i suggest if you uninstall makafee try this firewall and antiviruis: zonealarm and avast. these are found on www.download.com. there are award winning and are fabulous products. if makafee is uninstalled and you have scanned for viruis and spyware, then it could be a promblem with the browser.